As much as we love feature-packed applications that perform countless tasks, there’s nothing wrong with an inexpensive utility that does the one thing we need without much fuss and bother. 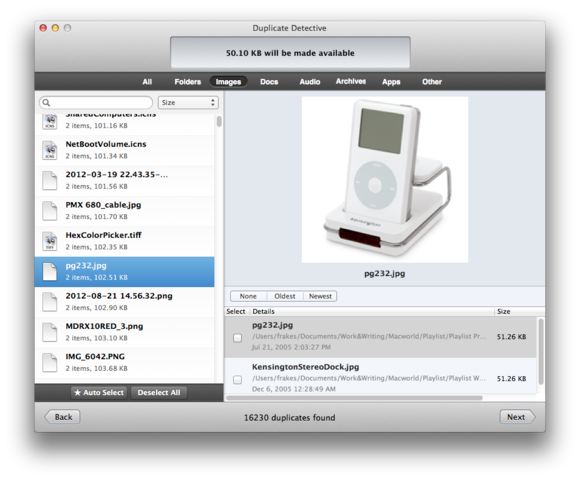 Such is Fiplab’s $5 (currently on sale for $3) Duplicate Detective (Mac App Store link). As its name implies, it exists to locate duplicate files on your Mac and then, if you wish, fling them into the Trash. Duplicate Detective does its work in a simple way. Just launch the application, and then drag a folder or volume into the utility’s window. Duplicate Detective scans that folder or volume, and then lets you know how many duplicates it finds. What it's specifically looking for are exact duplicates by comparing each file’s hash strings. If the strings match up, you have a duplicate; if they don’t—if one file is a PNG version of an image and the other a JPEG—the files are not included in the duplicate tally. When the job’s done, you’ll see the number of files scanned, the duplicate count, and the amount of storage space the superfluous files consume (thus giving you an idea of the amount of space you’ll save if you delete the duplicates). Once Duplicate Detective’s scan is complete, you can see the number of duplicates, as well as the space you'll save by deleting them. Duplicate Detective's results window shows all the versions of each file. With your choices made, click Next. A list of all the selected-to-delete files appears, so you can verify your selections. Once you’ve done so, click Clean, and those duplicates are moved to the Trash. The Trash isn’t emptied, however, so you’re welcome to check it one final time before you finally delete the files within (by manually emptying the Trash). Bare bones though it is, Duplicate Detective offers a couple of customization options. Within its Preferences window, you can exclude certain folders from the app’s scans. For example, if you’re concerned that you might lose an important image, you can exclude your Pictures folder. (Note that Duplicate Detective won’t scan the contents of a package, such as an installer or your iPhoto Library, unless you manually open the library package and specifically drag one of the enclosed folders to Duplicate Detective for scanning.) You can also tell the utility to skip files that bear a particular file extension—.key, for instance, to lay off any Keynote presentations you’ve created. But that’s about as fine-grain as Duplicate Detective gets. Other utilities, such as Hyperbolic Software’s $30 Tidy Up, offer scads of customization options and can search not only for exact duplicates, but also similar files—for example, Tidy Up can look for .mp3 and .aac versions of the same audio track. And you may find value in each approach—one app to easily remove exact duplicates, and another when you want to really dig in and find those “this is darned close to that” files. 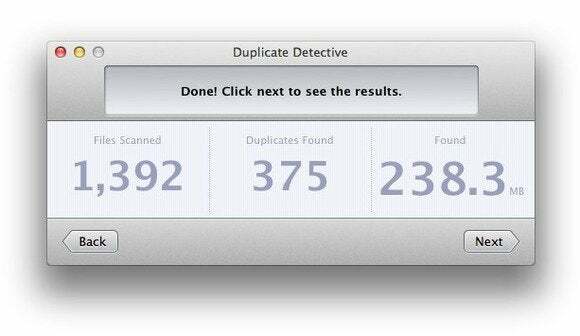 But for quick-and-easy duplicate finding, Duplicate Detective is a nice tool to have on hand.